Established in 1962 when American Joseph McMicking achieved his vision to develop the enormous potential that he encountered with the beautiful surroundings and countryside situated along the south Andalusian coastline midway between Marbella and Gibraltar, the 4,400 acre gated estate named Sotogrande quickly became one of the most luxurious urbanizations in Europe. Now famous for the top quality golf courses and polo fields situated within the estate that attract visitors all year round, not forgetting the leisure Port and the beautiful beaches that entice holidaymakers during the summer months, Sotogrande has a secret facet that appeals to its inhabitants. Look past the glitz and glamour and you will find a community of residents made up of nationalities from all over the globe living harmoniously together within the EUC (Entidad Urbanistica de Conservacion) urbanisation that is privately-run and pays for all the infrastructure and roads. These include families where the parents may be one of the many commuters that work in nearby Gibraltar and whose children attend either one of the local village schools or the Sotogrande International School; retired couples who are enjoying the benefits of a long working life and have chosen Sotogrande as the place to relax; or young professionals who not only work hard but also play hard. 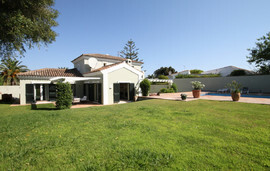 Let us assist you in finding your perfect villa, apartment, holiday home or investment property in Sotogrande, Spain. 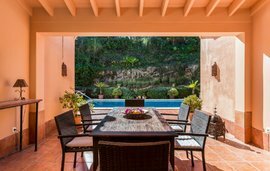 For more details, call us on + 44 (0) 208 299 2722 or contact our estate agents in Spain. 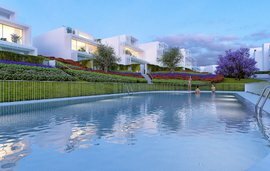 It is this community aspect that gives Sotogrande a village feel and, as it is just far enough away from the buzz of the more popular ‘hotspots’ such as Marbella, it has managed to ride the economic storm better than some of its neighbours and come out the other side. 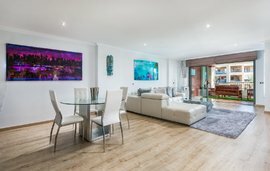 Property prices rise and fall but those that want to make a long term investment turn out to be the winners in this property game. The beauty of buying a home here is that there is something for everyone, from swanky penthouses in the marina to the waterfront apartments lining the route leading towards the river, from golf apartments to townhouses with communal pools, from single level villas to larger family sized homes and then, of course, there are the multi-million euro grandiose mansions! 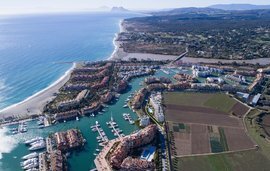 The coastal setting of Sotogrande is where the Mediterranean Sea greets a fresh swell from the Atlantic Ocean which rounds the nearby cape of Trafalgar and journeys through the Straits of Gibraltar before travelling further eastward along the coast. The River Guadiaro, spanned by a bridge built in 1979, provides a welcome source of freshwater. The climate is not always scorching hot with occasional chilly spells that require winter fires that remind the northern European residents of home. The whole urbanisation is extremely well managed and looked after and it even boasts the luxury of a daily rubbish collection. 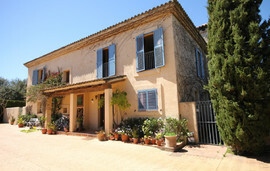 There are numerous tapas bars, bistros and restaurants and a selection of sports and social clubs to join. 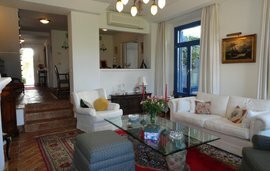 Sotogrande is an oasis, far away from the maddening crowds that offers a sanctuary for those seeking that exclusive lifestyle to which many aspire. 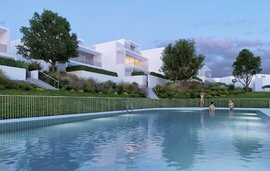 The good news is that this little bit of paradise is surprisingly achievable if you know where to look and if you are searching for Estate Agents in Sotogrande then we know the area like the back of our hands.